Hospital Fires Nurse For Racist Shirt Worn To Vote - Joe.My.God. 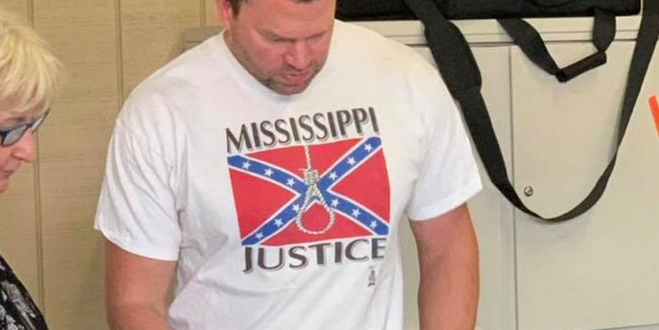 A Mississippi man was fired from his job for wearing a controversial shirt to the polls. A viral photo shows Clayton Hickey on Election Day voting in a t-shirt with an image of the Confederate flag and a noose on the front. The photograph, which was taken at a polling center in Olive Branch, Miss., outraged fellow voters and sparked controversy on Twitter. County officials confirmed to FOX13 that the man didn’t break any laws by wearing the shirt. The law only states that voters cannot distribute campaign literature or wear a shirt with a candidate’s name on it near a polling center. Reports identified the man as Clayton Hickey, a nurse working at a hospital in Memphis. His employer, Regional One Health, promptly investigated the matter internally. Hickey had previously been a police officer in Memphis, but resigned after being caught in a car with a 17-year-old girl and alcohol, WREG-TV reported.